Because we get some materials from Brazil including wire frames, certain sequin colors, sequin appliqués, and samba sandals and boots, we can never guarantee a delivery date. Dealing with international orders and the business model in Brazil, does not allow us to promise a delivery date. Our delivery times for making new costumes vary between a couple of days for altering in stock items, to 6 to 12 weeks for new orders. We try our best to get you your costume in a timely manner. Ninety percent of our orders arrive in the time frame we predict, ten percent do not. We suggest that you order 2-3 months ahead of time in order to have the greatest chance to get your costume when you want it. We will be implementing several new production techniques here in our design studio where we will hopefully become less dependent on certain items and be able to be less dependent on supplies from others. Our return policy is that if you do not like a costume or want to cancel an order, you can return it but you will loose the deposit or 50% and you are responsible for the return shipment. 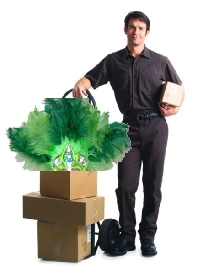 We suggest you insure the costume when shipping so if it gets lost, then you do not loose your deposit. Once a costume is returned and we see it is not damaged in any way, you will receive a refund of your deposit of 50%. We do not accept returns on any footwear. Footwear is inspected before going out to insure no defects. Please double and triple check your size before making an order. I understand that Samba Collection does not guarantee costumes before a delivery date. I understand that I am not entitled to a refund if my costume does not arrive before a planned date for arrival. I understand that if I change my mind and do not want the costume, I loose the deposit on the costume or 50%. I understand that Samba Collection does everything it can to adhere to a planned date of delivery.